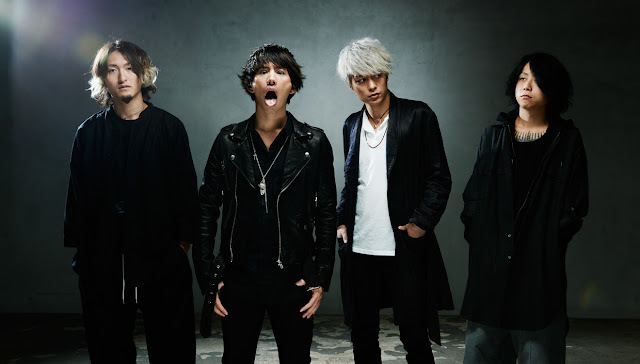 ONE OK ROCK Participating in AFTERSHOCK Festival | VKH Press – J-Rock & Visual Kei Coverage Worldwide! Previously we announced ONE OK ROCK's upcoming U.S. tour and their participation in All Time Low's and Sleeping With Siren's tour as well. In the middle of these two major events, the band will also be part of the Line-Up for this year's Monster Energy AFTERSHOCK Festival, which will feature a spectacular music lineup of hard rock, alternative and metal artists, as well as an expanded festival site with onsite camping Saturday, October 24 and Sunday, October 25 at Gibson Ranch just outside Sacramento, CA. In addition, the festival will feature live, in-ring matches with WWE's NXT Superstars. 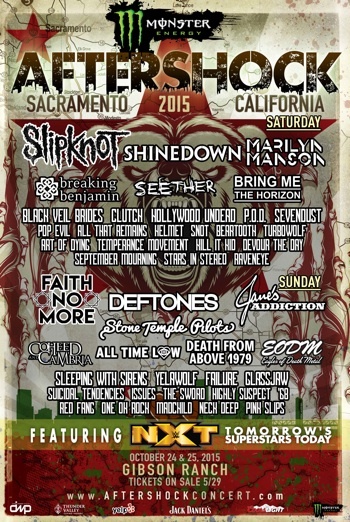 The impressive band lineup for Monster Energy AFTERSHOCK 2015 includes Slipknot, Faith No More, Deftones, Shinedown, Jane's Addiction, Marilyn Manson, Coheed & Cambria, Stone Temple Pilots, Breaking Benjamin, Seether, Bring Me The Horizon, and many more who will be sharing four stages among them. In addition to music performances, Monster Energy AFTERSHOCK will feature live, in-ring matches with WWE's NXT Superstars. NXT is WWE's developmental division based out of the state-of-the-art WWE Performance Center in Orlando, Florida. Over the past two years, NXT has grown into one of the hottest sports entertainment brands in the world, featuring incredible athleticism and compelling storylines that can be seen every Wednesday night at 8 PM ET on the award-winning WWE Network. Tickets are available at www.AFTERSHOCKConcert.com/Tickets, See below for more details on the regular prices. This year the festival is expanding to include onsite camping and the Monster Energy AFTERSHOCK Tequila World due to its huge success in the past. Additional experiences include artist autograph signings at the Monster Energy Hospitality Rig, the Monster Energy viewing area with beverage sampling, Thunder Valley Casino Resort VIP Lounge, the Jack Daniel's Experience, The Crazy Dave's Music Experience, band autograph signings, various onsite sponsor activities, and a variety of food and beverage options, including local gourmet food trucks. For those of you who love to drink, Monster Energy AFTERSHOCK Tequila World will feature a wide range of tequilas, extreme margaritas, gourmet tacos, mixologists and more, and can even learn about Jack Daniel through the mobile museum "Jack Daniel's Experience". Guests will also see (and smell) whiskey dripping slowly through charcoal and the new oak barrels used in maturing Tennessee's finest whiskey. On top of all of this, there is The Crazy Dave's Music Experience, which is a free, interactive "rock star" exhibit where fans can get hands-on interaction with tons of musical equipment—much of which is used by their favorite artists performing on stage at the show—and attend artist signings with members of various AFTERSHOCK bands. Monster Energy AFTERSHOCK and The Crazy Dave's Music Experience also host a group of local music students as part of The Student Experience, which includes a backstage educational tour and participation in various contests and activities at The Crazy Dave's Music Experience tent. *VIP tickets include: a VIP entrance to venue; access to the Thunder Valley Casino Resort VIP Lounge area featuring dedicated bar, beverage and food service; viewing of main stage (seated and standing areas); seated area with shade for dining and private restroom facilities; a VIP commemorative guest laminate, and more. The festival is fueled by Monster Energy. Additional 2015 sponsors include: Coors Light, Jack Daniel's, Thunder Valley Casino Resort, WWE, The Crazy Dave's Music Experience, Dimple's Records, Marshall Headphones, Yelp, Sacramento News & Review, Sacramento Bee and more to be announced.